MSU BILLINGS NEWS— Montana State University Billings College of Business students are joining forces with the Volunteer Income Tax Assistance (VITA) program to provide free tax preparation and filing for the Billings community. 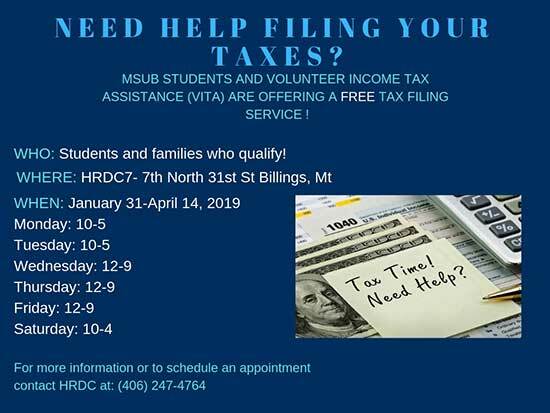 A longstanding tradition, COB students have joined with VITA to provide free tax services at District 7 Human Resources Development Council (HRDC7), located at 7 North 31st Street in Billings. This free service is available now through April 14 at the times listed below. Tuesdays: 10 a.m. - 5 p.m.
Wednesdays: noon - 9 p.m.
Thursdays: noon - 9 p.m.
Fridays: noon - 9 p.m.
MSUB VITA site coordinator Scott Gorman is excited to continue this service with students. The program provides free income tax return preparation and electronic filing for individuals and families making less than $52,000 a year. Both state and federal tax returns are prepared by Internal Revenue Service trained and certified volunteers. Also serving as the MSUB Accounting Club president, Gorman predicts the club will help prepare and file several hundred returns for the Billings community. The Accounting Club uses these community service hours for Service Sting, a volunteer service sponsored by the MSUB Center for Engagement. The club hopes to bank 500 volunteer hours for this year. Mary Beth Shay, VITA HRDC site coordinator said the organization is grateful for the boost in volunteers from this initiative. HRDC is a private nonprofit Community Action Agency dedicated to the promotion of self-sufficiency and alleviation of poverty. If none of the HRDC’s VITA site times work with an individual’s schedule, they are encouraged to visit www.montanafreefile.org to find additional resources. For more information or to schedule an appointment at an HRDC VITA site, call (406) 247-4764. Below is information to prepare for filing taxes this year.